Our Abpromise guarantee covers the use of ab7086 in the following tested applications. Publishing research using ab7086? Please let us know so that we can cite the reference in this datasheet. 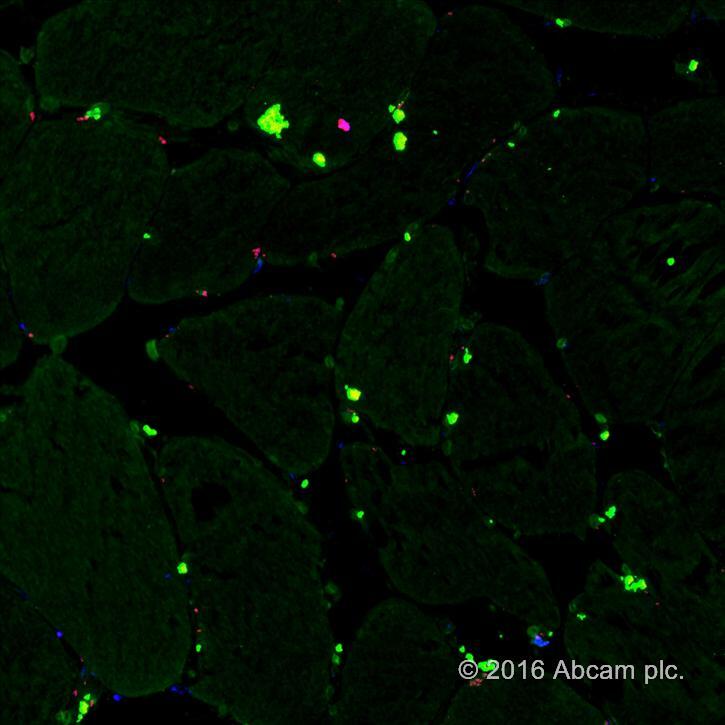 Used as part of an ISH/IHC double stain on fresh frozen human skeletal muscle. Used at a 1/200 dilution to bind to the Abcam Caspase-3 primary antibody (ab52293). Incubated at room temperature for 60 minutes in a dark staining chamber. My customer is looking for an anti-mouse secondary antibody with fluorophore conjugate which can be detected with blue filters (wavelength 460-490 nm) in his fluorescence microscope. He is also considering ab7086 (anti-rabbit FITC) for a second primary antibody for his double IF simultaneous protocol. Please advise if ab47052 can be detected with this blue filter? If not, can you kindly recommend one? I can confirm that the ab47052 can be detected with this filter at 460 to 490nm. Indeed, the fluorochrome AMCA has a maximum emission at 445nm, however the fluorescent emission between 460 and 490nm should still be detectable. Obviously the signal would however be stronger if the customer would have a filter letting pass 445nm as well. Please note however that the ab47052 is an anti mouse antibody. The ab7086 coupled to FITC can also be used as emission maximum of FITC is at 519nm. Even though the spectrum is quite large, the emissionis very low under 500nm. (http://en.wikipedia.org/wiki/Fluorescein)I am therefore positive that those two fluorochromes can be used together without any significant interference. The only thing I would like to draw your attention to, is that the ab47052 has not been crossabsorbed. This means we do not know whether this antibody would also recognize the rabbit antibodies. For a double staining it is therefore imperative that the customer makes this control (using only primary rabbit antibody and secondary anti mouse antibody to see whether there is any crossreaction). We unfortunately do not have another anti mouse antibody with a "blue" fluorochrome which would be already pre-absorbed. The ab7086 howeverhas been preabsorbed and is therefore perfectly fine for the double staining. I hope this information is helpful. Please do not hesitate to get back to us, should you have any additional questions. Our lab is about to start doing immunohistochemistry on frozen sections of mouse brain with primary antibody from rabbit. He have access to a confocal microscope and a fluorescent microscope with a UV lamp. Which antibody conjugation would allow for the easiest and best signal detection (ab7086, ab6720, etc.)? Also, I have rviewed your protocols for IHC, and find all the various adjustments confusing. If you can make a recommendation, can you also please indicate which protocol should be followed? Thank you. Thank you for your enquiry. First, when selecting a secondary antibody conjugated to a fluorochrome, you're limited by the available microscope filter sets that go with your microscope. Most filter sets are best matched with rhodamine or fluorescein. Texas Red® may also be used with a rhodamine filter set. So you want to determine which filter sets that you have and then choose an appropriate secondary to go along with your primary antibody. On our website we have a nice chart with various fluorochromes and their corresponding wavelengths. Just select the resources tab and then click on antibody guide from the drop-down menu. Then choose "choosing an antibody" and click go. I would recommend following the 2 Step Fluorescent protocol that we have listed on the IHC - Frozen sections / Cytological preparations protocols section on our website. A really good IHC website (IHC World) that you may want to refer to is below. http://www.ihcworld.com/introduction.htm It has a lot of good protocols and details, and should be helpful for you. If you have any additional questions, please do contact us again.